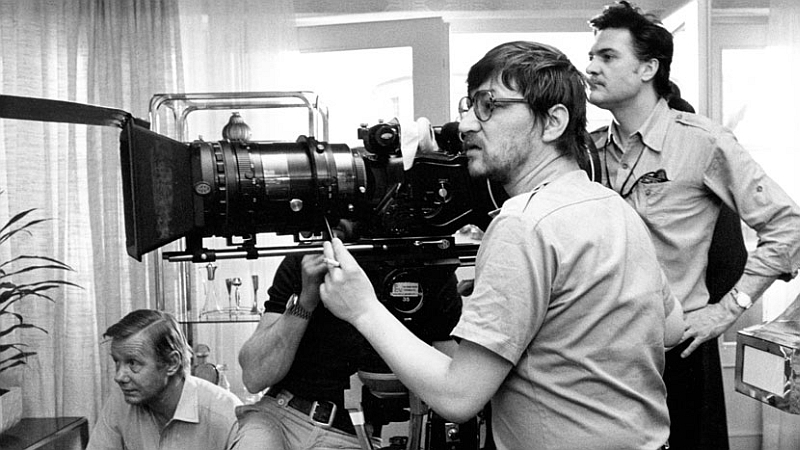 Running from Monday 27 March – Wednesday 31 May, BFI Southbank’s major Fassbinder retrospective will celebrate the constantly controversial and fearless filmmaker Rainer Werner Fassbinder, arguably post-war Germany’s greatest director. This extensive retrospective will feature most of the great auteur’s huge body of work, from gangster movies to melodramas, social satires to queer dramas. Fassbinder is perhaps one of the most prolific filmmakers of the 20th century; his first 10 features were astonishingly made in less than two years, and he went on to make another 30 by the time he died young at 37. A fearless artist who knew no taboos, Fassbinder combined scathing social criticism with profound psychological insight. The season kicked off last month with a special screening of Fassbinder’s The Marriage of Maria Braun (1978) and an introductory talk Rainer Werner Fassbinder: Wunderkind, Iconoclast, Star by Martin Brady (King’s College London, GSSN), followed by the re-release of Fear Eats the Soul (1973) on Friday 31 March. Playing on extended run during the season, this was Fassbinder’s international breakthrough. A bold reworking of Douglas Sirk’s All That Heaven Allows, Fear Eats the Soul is an unconventional love story which combines lucid social analysis with devastating emotional power; arguably Fassbinder’s best loved film, it is still, 40 years on, burningly relevant. Forthcoming highlights in April and May include a Fassbinderian Politics Study Day and The Bitter Tears of Fassbinder’s Women: A Symposium. There is also a Fassbinder collection available on BFI Player+ from 31 March, comprised of 10 of his best-loved films including Fear Eats the Soul (1973), The Bitter Tears of Petra von Kant (1972) and Fox and His Friends (1974). BFI and Arrow Films, who will be distributing the re-release of Fear Eats the Soul, have also worked together to make a number of the films available across the UK in new DCPs. An insatiable film addict from early childhood, Fassbinder drew inspiration from the French New Wave and, later, from the Hollywood melodramas of Douglas Sirk and others. Running alongside the season, the BFI’s regular Big Screen Classics series will showcase some of these films; Fassbinder’s Favourites will include Sirk melodramas All That Heaven Allows (1955) and Imitation of Life (1959), pioneering French New Wave films Vivre sa vie (Jean-Luc Godard, 1962) and Le Signe du lion (Eric Rohmer, 1962), as well as Hollywood classics such as All About Eve (Joseph L Mankiewicz, 1950) and Gentlemen Prefer Blondes (Howard Hawks, 1953). The series will also continue in May with further titles Fassbinder has cited as influential to him. Rainer Werner Fassbinder’s films – whether about rebellious housewives, gay hustlers, or communist terrorists – are all deeply political. But he was a contradictory and provocative artist who defied categorisation. At this study day we’ll attempt to reveal what Fassbinder really stood for. Through thoughtful presentations and engaging discussion, we’ll examine his preoccupation with marginal figures (and intersectional solidarity among them), re-evaluate his provocative representations of LGBT characters, and consider how his forensic analysis of class exploitation contrasts with his critique of left-wing institutions. Join us to discover a radical filmmaker whose complex politics have profound relevance today. mass audience, in their own homes. complex creative and personal entanglements with key female actor-collaborators (such as Hanna Schygulla, Margit Carstensen, Brigitte Mira and Irm Hermann), and the mixture of cruelty, fascination and empathy he showed for his vital and compelling female characters. In the latest in our popular series exploring cinema through a philosophical lens, we consider Fassbinder’s spiky, provocative critique of German bourgeois values. Chinese Roulette depicts a savage world riven with infidelity and loathing, where people cruelly goad each other into revealing their deepest secret thoughts and desires – but what truths does Fassbinder unearth? Join film philosophers William Brown, John Ó Maoilearca and Catherine Wheatley as we explore how Fassbinder gives expression to the darkest chambers of the German soul via his repressed characters and their relation to space, objects and each other. culture to terrorism! Beginners and experts welcome. Full listings and booking details for all the films included in the Fassbinder season as well as ‘Big Screen Classics: Fassbinder’s Favourits’ can be found on the BFI website.